That time of the year has come and gone & I'm currently paying for it. 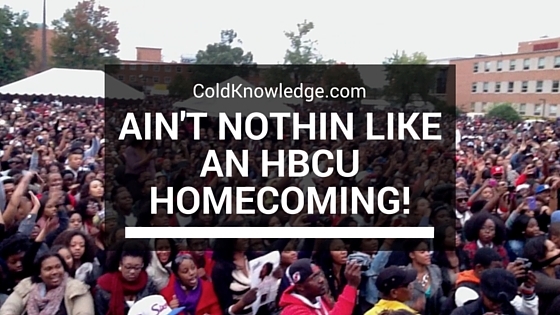 There are stats that I could throw out about HBCU's and there are other cool tidbits I could post from other blogs about how much money HBCU homecoming's like GHOE, SpelHouse and FAMU bring in. But the truth of the matter is, those are the least interesting facts. I mean yea it's cool to see celebs come and party it up with you, you get to tailgate with great food and drinks. But the real fact of the matter is, an HBCU homecoming is more so about being a big family. It's where the young and the old come together and put together the perfect blend of cooking out and partying, coupled with taking care of our own. Of course you'll have those people that will find any and everything to complain about when it comes to the parties or other events. For me, seeing all the faces you started out with freshman year, and other people who eventually came to the school throughout your time there is what it's all about. This year I saw a lot of people that I haven't seen in years, due to their personal life, or mine. It was so great seeing so many people out there, and just being able to kick it with them and shoot up the old days. Two errors on my part being one, I didn't attend enough events where people where out and about at, and two, not taking enough pictures. I'm really not big on the picture taking scene but I'm going to learn how to be for next year. Plus I'll have my phone fully charged for the event because there are so many people that I will want to take a picture with. Next year marks the 150th anniversary of Shaw University, I know homecoming will be bigger and better than it has ever been to date, all the old heads are already planning cookouts and tailgates as we speak lol. So I'm going to add those to my plans for 2015 and start saving and thinking of ways to increase the fun. My one beef are these venues for the parties, and that's mainly only the city. I actually want to be in a club where it's a club and not a restaurant or bar that's over packed and no one can move. There' pretty much only one club here that's a real club, Solas. I don't know what it would take to get a party hosted there for homecoming, but whatever that may be, I need someone to look into it. Well the venue and the time the party shuts down. I think 3 is way too early to tell everyone to leave, it's homecoming, let people live it up a little bit we want to do things til the break of dawn if all the chips fall into the right places. The prices for the parties aren't bad at all either, if you get your tickets in a timely manner, and everyone can agree on which party to attend. I actually have another beef too. I want the presidents of these schools here in North Carolina, and strategically plan these homecomings. Like to have three homecomings that could make money potentially for three different cities at the same time isn't cool at all. Plus I would love to go to GHOE and get me a fish plate at the game and some other free food and catch up with people I know who went to school there, and the millions of other folk like myself that I know who travels up there. Communication between HBCU's about this is important because it can bring a lot of revenue in for the schools and make them money. Overall I missed a lot of the people that I saw for the first time in a long time, and it felt great to just shoot the breeze with them and hear how they missed the old days of all the fun we use to have and then proceed to have fun by just being out at parties and kicking it. Realizing that a lot of those people are just like family and we've been rocking it for almost 10 years is just part of the reason going to an HBCU homecoming is so dope. Well that and the fact that there was an over abundance of food and beer everywhere to drink. Next year will be even bigger just with all the people that are actually planning to be there and on the yard. 2014 Shaw University Homecoming was pretty good by my standards, definitely better than 2013, nowhere close to 2012. The excitement of 2015 has officially started. I also know that I better hit the weight room because I wasn't ready for all the running jumping hugs this year, I have bad knees to work on lol.